"Just a quick one to let you know we had the most amazing night with Davy Jones' Locker. It was so much fun and everyone that came got right into it. Thanks so much for coming back to me so quickly, you calmed my worries! Looking forward to our next party! " "As a group we've been playing Murder Mysteries for around 25 years now and have sampled most brands with numbers from 6 up to very large groups and sitting at a table playing in rounds to the free flow of Freeform games. Davy Jones' Locker is the first Freeform game we played (although our kids enjoyed the Pirate Island game a couple of years ago), and we loved it – plenty to do to keep everyone occupied all night and even the two newbies (who coincidentally were the two who didn't have English as a first language) were able to get right into it straight away, working on their goals. Architect Matt organised our holiday cottage into a galleon with the help of massive pictures of parts of the ship – and we ate fish n chips from the local Chippy. A perfect evening. Looking forward to the next." "We took our adult children (ages 20–26) and spouses on a houseboat trip for 4 days. Played the Davy Jones Locker game. IT WAS A HIT! They thoroughly enjoyed it. It was great to watch them play act and be kids again. I would recommend it to anyone – it really was great fun!" "Many thanks for all your help. My son's 18th birthday went down superbly with the help of Davy Jones' Locker. We had about 14 attempted murders, one marriage and countless double dealing. The characters were great and the plot intricately woven – some people kept their secrets better than others, but all had a fantastic time." "We just played Davy Jones' Locker. We had a blast with this game. We have been playing the murder mystery games for a year now. We just finished all of another author's games. I have been looking for more games like hers. YOU FIT THE BILL. Thank you. Our group consists 4 couples and 2–5 teens. We have a murder a month. We loved Davy Jones' Locker. We had to play a couple of DUDS before we found you. I am so glad we kept looking. Don't stop writing them." "We had a super Davy Jones' Locker evening! We have used other games before, but the consensus was that we like the creativity of the freeform format best. We will be using your games again." "Davy Jones' Locker was most of our group's second time doing a murder mystery. We had a clever hostess that made up new and interesting ways to help us achieve what we wanted. I know that this ended up very twisted in the end, but that is the fun of these types of games! Lots of laughs and many more to come with our next one. Thanks so much!" "There was a great range of characters in Davy Jones' Locker, which made it easy for me to pick people to play them. Everyone was talking to everyone else, despite not having met them previously. " "Davy Jones' Locker went well with a lot of intrigue. Our group loves pirates and most costumes were already in the closet. This was the first freeform game our group has done. They're ready for another." "We played Davy Jones' Locker last weekend and had a blast! This is the eighth game I've played, and with a variety of groups of people, and this was as much fun as ever! This was a new group of people and at first they seemed a bit overwhelmed, but once I pointed them toward the "tips for beginners" and encouraged them to use their ability cards, the game took off. Right away people were making deals and deceiving one another. No one wanted the boat to land (well, except the person who got thrown overboard, but that was at the last minute…)"
"I am well known for hosting murder mystery parties but I can 100% say that Davy Jones' Locker was the best one I have ever done! I only stumbled across this game after looking for a boat themed murder mystery for our boating holiday on the Norfolk Broads, but I definitely will be purchasing one of these freeform games again! Thank you for providing a great evening, loved by all!" "Davy Jones' Locker seemed like the best theme for my group of players… I loved it! Wouldn't change a thing." "Now that we've tried a freeform game, we'll never host another type of mystery dinner party! Six months later, our guests are still talking about what a fantastic time they had with Davy Jones' Locker." 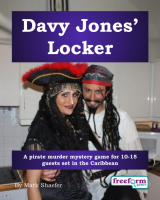 Davy Jones' Locker is a dinner party murder mystery game for 10 to 15 guests and a host – download the free introductory pdf file. Join us in a thrilling evening of intrigue, double-dealing, mysterious powers and murder. You will be in the middle of the action and it will be up to you to wheel and deal with the other guests. Can you achieve your goals, keep your secrets hidden and survive Davy Jones' Locker? It's up to you. It is 1785, and the Caribbean is a hotbed of violence, treachery, the occult and, of course, piracy. Tortuga, an island off the north coast of Haiti, is home not only to peaceful plantations, but also to thieves, gypsies, scavengers, voodoo queens and grave robbers. Tortuga is also a pirate stronghold and a frequent port-of-call for the most feared pirates in the Caribbean. Abel "Blackheart" Read, the Caribbean&apos;s most nefarious pirate, had wrought havoc for many years throughout the region – but now his reign of terror is over. First, Blackheart and the Pegasus, his ship, was captured a month ago -- and then two weeks ago Blackheart&apos;s second-in-command, Calico Jack, ran his ship (the Orion) aground off Tortuga&apos;s rocky north coast. With these two pirates (and their ships) out of business, the waters of the Caribbean are much safer. They have also created a power vacuum in the pirate world – one that will no doubt be filled before too long. In Davy Jones' Locker, the course of this fateful journey will be played out over the course of a single evening. There are, among the passengers and crew, an ex-pirate, a gypsy, and a nun. However, not everyone is who, or what, they seem. Some (well, all) of those on board have mysterious secrets and will do anything to prevent them from being revealed. Davy Jones' Locker lasts for about four hours and is suited to an evening. It is often played over a meal – a finger buffet if possible to allow guests to circulate and talk in private. "Davy Jones' Locker was fantastic. All the scheming and backstabbing made for a great time. A great night was had by all!" The free introductory pdf file contains an introduction to the game, a cast list of all the characters, and a copy of the Tortuga Gazette – plus details of how to buy the game. Captain Hargrave – Captain of the Libra – formal, proper and straight-laced. Darrell Sims – A plantation manager. Dirty Dana – An opium dealer. Drunken Willie – A Tortugan drunk. Esmerelda – A flamboyant gypsy. First Officer Cook – The Libra's First Officer, and Captain Hargrave's loyal aide. Jean La Croix – A retired French Naval officer. Maggie Brown – A young Tortugan woman. Mambo Faith – A poor Tortugan woman. Rummy Ike – A sailor. Rusty Mike – A ruthless bounty hunter wearing an eye-patch. Saucy Sue – A Tortugan wench. Shanks McCaffee – A Tortugan cook. Sister Agnes – A nun. Slippery Pete – A grizzled ex-pirate and seaman. Davy Jones' Locker is unlike many murder mystery games. This game, unlike most of our mysteries, doesn't start with a murder. However, by the end of the journey it is unlikely that everyone will survive! Davy Jones' Locker is played just like a murder mystery game. You may be trying to solve the murder, but primarily you are (initially at least) concentrating on your own goals and objectives. Unlike most boxed murder mystery games, Davy Jones' Locker lets you decide how to achieve your goals and thwart your enemies. "Everyone really enjoyed Davy Jones' Locker – they commented that it was so different from other murder mysteries they've played, and it was much better than they were expecting after previous experiences with scripted games." On the evening of the game the guests are met by the organizer, the Deckhand, and welcomed aboard the Libra. They then receive their detailed backgrounds - including dark secrets, objectives and money. The fun then begins as they form alliances, blackmail each other, steal items and maybe even try to murder one another! Along the way they may uncover some of the mysteries of Davy Jones&apos; Locker. Who was responsible for Blackheart&apos;s capture? Who really wrecked the Orion? Will the Montenegro curse be broken? And perhaps most importantly of all, who will find Blackheart&apos;s treasure? Depending on what the players choose to do, there are several different possible endings, but finally everyone finds out how they did, and what secrets everyone else was concealing. Davy Jones' Locker costs £20.00 (GB pounds) or US $29.99. You can buy it in either currency, from anywhere in the world, as you prefer. The price will be converted back into your own currency for you, at today's exchange rate. We offer a Cast Iron Guarantee on all our murder mystery games. If you're not completely satisfied with Davy Jones' Locker then please let us know within 30 days and we will refund you. See our full terms and conditions here.